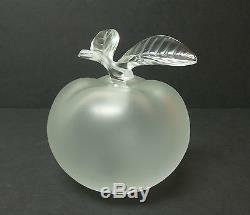 This listing is for a lovely vintage Lalique clear and frosted crystal Nina Ricci "Grande Pomme" large perfume bottle. This wonderful perfume bottle has a frosted apple shaped body with clear figural leaf stopper. The bottle has etched Lalique. France signature on the bottom. The bottle originally was introduced in 1952 and held the Nina Ricci fragrance "Fille d' Eve" and comes in several sizes with this being the largest. This gorgeous bottle is in excellent condition with no chips, cracks or repairs. The bottle (with stopper in place) measures 5 3/4" high and is approximately 5 3/4" wide. We at Antiques & Moore have been in the Antiques business for over 30 years and try to describe our items as accurately as possible. We are happy to answer any questions and always appreciate your business! The item "LALIQUE NINA RICCI LARGE GRANDE POMME (Apple) CRYSTAL PERFUME BOTTLE" is in sale since Wednesday, November 11, 2015. This item is in the category "Pottery & Glass\Glass\Art Glass\French\Lalique".